It's been four years since the world's first virtual hip-hop-pop band unleashed its sinister brand of simian concocted sounds on an unsuspecting public with the release of "Gorillaz," their self-titled debut. Thanks to uber-producer Danger Mouse (aka Brian Burton), Damon Albarn and his cartoon posse have made the wait largely worthwhile with their current release, "Demon Days." The Gorillaz shtick, hatched five years ago while Brit-pop sensations Blur were on a hiatus, was developed when singer-songwriter Albarn hooked up with celebrated animator Jamie Hewlett, famous for his "Tank Girl" comic creation, and producer Dan "The Automator" Nakamura. In a savvy postmodern commentary on celebrity, Hewlett's edgy animation characters front the band, appearing in clever videos and special events. According to legend, the doom-dosed cartoon characters discovered each other while slumming around the discarded cigarette butts and beer cans of London's Leicester Square. Whatever the case may be, Gorillaz' comic facade has proven to be as potent as their music. Their debut, a refreshing take on Beck's "Odelay"-era inspired jams, included members Chris Frantz and Tina Weymouth, the rhythm section from the Talking Heads, and Cibo Matto vocalist Miho Hatori. It spawned "Clint Eastwood," a mish-mash of alternative pop and hip-hop raps coupled with Albarn's stoner vocals, which made it to number three on Billboard's singles charts in 2001. "Demon Days" is not a radical departure. It retains Hewlett's striking visual presentation, but the music is enhanced with the inclusion of Danger Mouse. DM's stunning 2003 release, "The Grey Album," a controversial hybrid of the Beatles' "The White Album" and Jay-Z's "The Black Album," caught the attention of Albarn, who said, "I loved the metaphor, the mixing of genres and the idea that you can take past and present and make something futuristic." 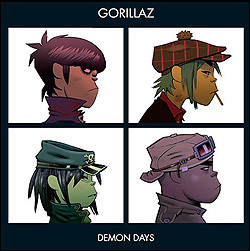 Albarn quickly hired DM and his influence is all over "Demon Days." Whether it's the icy synths on "Don't Get Lost In Heaven" or the Cars-inspired arpeggios for "Kids With Guns," the album's choicest cuts are due to his deft touch. "Intro" kicks the proceedings off with a sample from the zombie horror flick, "Dawn of the Dead." It succeeds in creating an ominous post-apocalyptic vibe that includes wailing sirens bleeding through the mix. With a nod to the 1972 synth-pop classic "Popcorn," the next track, "Last Living Souls," takes off with a ping-pong percussion that effectively bounces away the ghoulish atmosphere. DM's production pulls the song out from under Albarn's wasted somnambulist delivery, thanks to some colorful synth-splashes and a melodic piano refrain. I need a gun, cos all I do is dance"
These sobering lyrics clash with the ethereal voices, creating a tension between the luxurious pursuit of pop-art projects like the Gorillaz and the very real fight against global poverty. This dichotomy echoes themes explored by Albarn on 2002's Oxfam project, Mali Music, as well as those addressed by the upcoming Live 8 African relief concerts (http://www.live8live.com) currently being organized by Bob Geldof. The album's first video, "Feel Good Inc.," is an exuberant number that hitches itself to a chugging low-fi guitar riff courtesy of former Verve member, Simon Tong. Hip-hop godfathers De La Soul bring the "feel good product" to life with fluid rhymes and a gut-busting laugh that rips through the beginning and end of the track. Over half of the album features guests, including MF Doom who adds his trademark reefer-laced raps on "November Has Come." Incredibly, Ike Turner, once married to Tina, also chimes in with some blues piano licks on the laid back "Every Planet We Reach is Dead." How this member of the regal American 1960s soul scene was ever enlisted would make for a fascinating song in itself. "Falling out of airplanes and hiding out in holes. Waiting for the sunset to come, people going home. Jump out from behind them and shoot them in the head. Now everybody dancing, the dance of the dead"
Despite its all-star cast and clever mashing of contrary themes, "Demon Days" has its flaws. While only a handful of the songs come off sounding as filler, most notably, "O Green World" and "El Manana," these combined with other noodles like "Dare" equal almost one third of the album's total fifty-minute length. Just as the album begins to pick up steam, these weaker patches bring it down and create the sense that it's dissipating before our ears. Overall however, "Demon Days" stands out as a tribute to risk-taking experimentation and maintains an air of spontaneity. This is music fashioned from both the past and present for a future one can only hope exists solely in the imaginations of its participants.